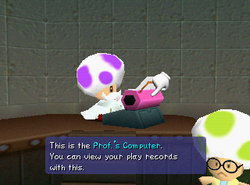 Professor Fungi typing on his computer next to his assistant in Mario Party 2. Professor Fungi is a Toad professor in Mario Party 2. He is found in Option Lab, typing the player's records on his typewriter (or computer as it is called in the game). The records Professor Fungi wrote contain how many times the player played the game-boards in the game, how many times the characters won, minigame records that the characters will attempt to beat the record in the minigame, and Driver's Ed records when the player unlocks the minigame as the player can attempt to beat the record when playing the minigame. He also has an unnamed assistant with a garbage can next to him. If the player deletes their save file, Professor Fungi throws the player's records in the trash can. In the Japanese version, Professor Fungi has a pipe smoker; it was removed in the international versions. This is done to remove tobacco references. This page was last edited on September 8, 2018, at 10:50.